For the newspaper, see The Moscow Times. Moscow Time (Russian: моско́вское вре́мя) is the time zone for the city of Moscow, Russia, and most of western Russia, including Saint Petersburg. It is the second-westernmost of the eleven time zones of Russia. It has been set to UTC+03:00 permanently on 26 October 2014; before that date it had been set to UTC+04:00 year-round since 27 March 2011. Moscow Time is used to schedule trains, ships, etc. throughout Russia, but airplane travel is scheduled using local time. Trains are going to follow local time by 1 August. Times in Russia are often announced throughout the country on radio stations as Moscow Time, which is also registered in telegrams, etc. Descriptions of time zones in Russia are often based on Moscow Time rather than UTC. For example, Yakutsk (UTC+09:00) is said to be MSK+6 in Russia. Until the October Revolution, the official time in Moscow corresponded to UTC+02:30:17 (according to the longitude of the Astronomical Observatory of Moscow State University). In 1919 the Council of People's Commissars of the RSFSR introduced the system of time zones in the country, while Moscow was assigned to the second administrative time zone, the time of which should correspond to UTC+02:00. Other zones east of the 37.5° meridian to Arkhangelsk, Vologda, Yaroslavl, Kostroma, Ivanovo, Vladimir, Ryazan, Tula, Lipetsk, Voronezh and Rostov-on-Don were also included in the second belt. In accordance with the 16 June 1930 Decree of the Council of People's Commissars, the Decree Time was introduced by adding one hour to the time in each time zone of the USSR, so that Moscow Time became three hours ahead of Coordinated Universal Time. Until 2011, during the winter, between the last Sunday of October and the last Sunday of March, Moscow Standard Time (MSK, МСК) was three hours ahead of UTC, or UTC+03:00; during the summer, Moscow Time shifted forward an additional hour ahead of Moscow Standard Time to become Moscow Summer Time (MSD), making it UTC+04:00. In 2011, the Russian government proclaimed that daylight saving time would in future be observed all year round, thus effectively displacing standard time—an action which the government claimed emerged from health concerns attributed to the annual shift back-and-forth between standard time and daylight saving time. On 27 March 2011, Muscovites set their clocks forward for a final time, effectively observing MSD, or UTC+04:00, permanently. On 29 March 2014, after the annexation of Crimea by the Russian Federation, the Republic of Crimea and the city of Sevastopol—two federal subjects established by Russia on the Crimean Peninsula—switched their time to MSK. Most of the European part of Russia (west of the Ural Mountains) uses Moscow Time. In Kaliningrad Oblast, Kaliningrad time (UTC+02:00) is used. Samara Oblast and Udmurtia use Samara time (UTC+04:00) and Perm Krai, Bashkortostan and Orenburg Oblast use Yekaterinburg time (UTC+05:00). In the Crimean Federal District, the disputed region of Crimea between Russia and Ukraine, the Moscow Time is also observed, as well as in the separatist territories of the Donetsk People's Republic and Luhansk People's Republic, which since 2014 control part of the Ukrainian Donetsk Oblast and Luhansk Oblast. Prior to 26 October 2014, Moscow Time was UTC+03:00. Daylight saving time was used in the summer, advancing it to UTC+04:00. Belarus, in 1930–1991, and again from 2014–present. Crimea, in 1930–1941, 1943-1990 and again from 2014–present. Samara Oblast (Russia), in 1989–1991, and again from 2010–2014. until 1990 in Kaliningrad Oblast. between 1989 and 1990 and in 2010 in Samara Oblast. 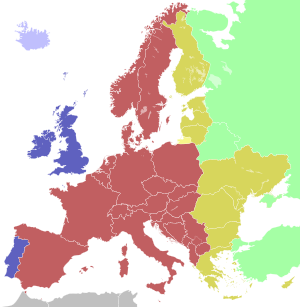 In 1922–1930 and 1991–1992, Moscow observed EET (UTC+02:00). Daylight saving time (UTC+03:00) was observed in the summer of 1991, and the city and region reverted to UTC+03:00 by the summer of 1992. ^ a b "Russia Turns Clocks Back to 'Winter' Time ,during British summer time however Moscow time is only 2 hours ahead of the uk , and 3 in the winter". RIA Novosti. 26 October 2014. Retrieved 27 October 2014. ^ "Russia Abolishes Winter Time". Timeanddate.com. 8 February 2011. Retrieved 26 March 2011. ^ "DPR and LPR switch over to Moscow time". Tass - Russian News Agency. 26 October 2014. Retrieved 11 August 2015.